One of the accessories that you definitely need when you own a dog is a pooper scooper. Whether you take your dog for regular walks or you want to clean up your own backyard, you are going to need a way to clean up after your pup. No matter what breed you have, from Golden retrievers and French Bulldogs, from Beagles to Rottweilers, the fact is that every dog poops, and everyone expects you to clean up the mess. Luckily, there are lots of great pooper scoopers on the market that will allow you to clean up your dog’s mass with a minimum of effort. In this buying guide, we will be looking at the top five pooper scoopers as well as the factors that you need to keep in mind when you’re buying one. Here are five of the top pooper scoopers currently on the market. They are perfect for all kinds of breeds, from the smallest of the largest, including Yorkshire Terriers, Boxers, Great Danes, Doberman Pinschers, Siberian Huskies and Poodles. Let’s look at these incredible pooper scoopers and why they are so highly recommended. This Petmate Arm & Hammer swivel scoop is one of the best on the market for several reasons, but the main one is how easy it is to use. 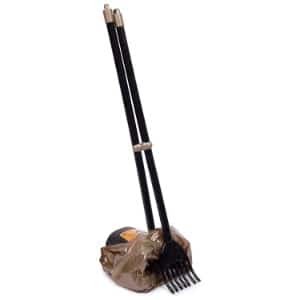 This is a two-piece pooper scooper with a rake and shovel attachment, but there are plastic dog poop bags that fit into the shovel attachment that allow you to pick up your dog’s poop with the rake and then throw it away at the nearest receptacle without having to worry about cleanup. The only thing you have to do is clean up the rake when you’re done, which can be done at the end of the day because there is not much mess on there. In addition, this pooper scooper has a number of features that you will love. For one thing, it swivel so that you can meet the poop head on. When you need to clean up after your dog, the easier it is to get the dog poop into the receptacle, the more you will enjoy taking your dog on walks and cleaning up after him or her. The best pooper scoopers on the market make the job of cleaning up after your dog something that is almost effortless, and that is exactly what this pooper scooper provides. Some of the other advantages with this pooper scooper include the fact that it can be used on multiple surfaces including grass and pavement, and the fact that it has extended reach without hurting your back. This is one of the cleanest and easiest-to-use pooper scoopers out there, with hooks on both sides of the bin to hold Arm & Hammer bags with odor control. There is plenty of room to grab onto the bag and tie it up so that you can dispose of it properly. Plus, the tool is lightweight and snaps together so that you can easily store it in a closet or on the wall of your garage without it taking up much space. From Dogit, this Jawz waste scoop is pretty amazing all-in-one tool that you can use to scoop waste from hard services or graphs. However, that is one thing that is unique and more challenging about this particular product – there is a separate tool for grass and a separate one for hard surfaces. The grass tool has sharper spikes to collect waste more easily. However, if you put that aside, this is one of the most useful pooper scoopers on the market. If you have an electronic dog door and your dog goes to the bathroom in yard, or if you put your dog in an outdoor dog playpen or outdoor dog kennel, then this tool is going to be extremely useful for you. This is the best pooper scooper for people who want an all-in-one device that they can easily carry it around with them. It is only a couple of feet long, and can be carried around easily in one hand. All you do to activate it is to pull on the handle and then use the scooper and rake action that is built into that handle to collect the waste and put it into the bin. You can then dispose of it into a plastic bag and throw it away. When you’re done with your walk, all you have to do is spray your pooper scooper out with the garden hose. It takes just seconds and it will be completely clean after you are done. There are so many accessories out there for dogs that you need to get, but a pooper scooper is definitely one of the most important. Just like you need a dog house, dog bowl or automatic dog feeder, dog bed and dog crate, you need a clot pooper scooper to pick up waste and you want to get the top-rated pooper scooper on the market. This is definitely one of those that fit that description, and you will find it very easy to clean up after your dog on walks or when they go out into the backyard. This is another Petmate product, and it has a couple of advantages over all of the other pooper scoopers that are listed here. The main advantage is that this works with normal grocery bags. This is a large capacity pooper scooper that has two pieces – the rake and the dustpan attachment – which are designed to work together perfectly and eliminate the need for any major cleaning after a walk. If you are using a grocery bag in the pooper scooper, then all you have to do is pull the bag out and throw it away. You shouldn’t have to clean the dustpan attachment at all. You may have to spray the rake off with your garden hose but it is extremely easy to clean. Just as you want to keep your dog cool in the summertime with cooling pads for dogs or cooling vests for dogs, or you want to know what they are up to with a dog activity monitors or GPS tracker for dogs, you want to be able to clean up after them with the best possible technology, and sometimes the simplest solution is the best solution. That’s exactly what this pooper scooper provides. This is a dog poop rake with dustpan attachment that is the perfect height to use without having to stoop over or bend down. You can easily put a bag on by lifting the dustpan toward you and remove the bag the same way. This pooper scooper is extremely sturdy and has a terrific swivel design that rotates to allow you to easily pick up poop without having to let go of your dog’s leash. When you’re done with your walk and you have cleaned off the rake, you can connect these two to make one piece and hang them easily from the walls of your garage or prop them beside the back door. 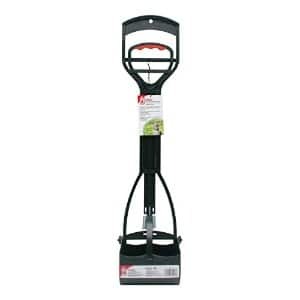 In addition, this has an adjustable reach so that you can set it to your perfect height with up to three feet of reach, and it is designed for easy use on both hard surfaces and on grass. 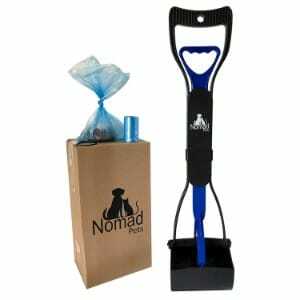 From Nomad Pets, this pooper scooper is one of the best gifts that you can give your dog. There are lots of gifts that you can get for your dog. You can get them indestructible dog beds if they have a tendency to tear theirs up, a dog ramp if they have trouble getting up on top of things or automatic fetch machines for dogs that get bored during the day and have anxiety. But this pooper scooper gift set is the perfect gift set for your dog, and it is even better for someone you know that has dog and needs a pooper scooper. This particular gift set can even be gift wrapped for birthdays, holidays or any occasion. This pooper scooper has so many advantages over most of the ones on the market that it would be difficult to list everything. It starts with the basic functioning of the device. This is an all-in-one unit that features jaws on the bottom and a handle on top with custom fit bags that you can easily install in seconds and pull off to throw away you dog waste just as easily. The handle is dual-recoil tension-controlled to allow you to determine how quickly or slowly the jaws close, the plastic bucket is made of advanced nonstick material and the serrated teeth are perfect for cleaning waste off of the grass. This pooper scooper makes it extremely easy to pick up your dog’s waist without smearing it or breaking apart you can easily clean up after your dog without having to bend over, and throwing the bag away when you are done means that the pooper scooper stays almost completely clean during your entire walk. The only thing you have to do is spray it off a little when you get back. It is big enough to handle even large breed dogs, and it even comes with rubber bands that secure the bag and place so that you can go out on a windy day and still use this advanced pooper scooper. 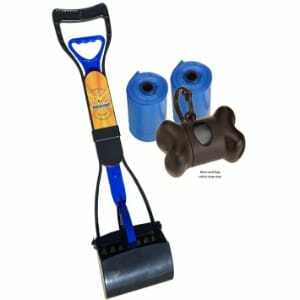 Bodhi makes this amazing pooper scooper which is available in two different colors: blue and pink. This is an all-in-one pooper scooper that is not separated into two parts, and it has lots of stuff that comes with it that make it one of the best pooper scoopers on the market. First of all, you don’t have to worry about bags with this pooper scooper. Many of the pooper scoopers on the market require specific bags to use the tool most effectively, and they are almost always sold separately. Even if they are included, it is usually a limited supply. But this pooper scooper comes with three large rolls of bags that are going to last you for many months or years to come. This is also an exceptionally easy pooper scooper to use. Whenever your dog makes a mess, you simply put a bag inside the compartment if you haven’t already and then set it down near the waste, using the handle to open up the compartment and then scooping it up with the rake closing to push it inside of the bag. You can then dispose of the bag if you like or wait until you have finished your walk to do so. In addition, this tool is made out of high-quality, lightweight, premium nonstick plastic and the serrated edge of the scoop is perfect for picking up waste without damaging or tearing grass. This pooper scooper tool comes with a 100 percent satisfaction guarantee and it comes from a brand that has earned quite a reputation for creating dog-friendly accessories. There are lots of things about this pooper scooper that demonstrates exactly why that is. This is easy to use, easy to change the bag with no mess and can be hung up or propped in the corner as well as easily carried with you on walks. The dual-spring handle gives you great control over your scooping ability and it will work on all types of surfaces including concrete, asphalt, dirt, gravel and grass. There are a lot of considerations to be aware of when it comes to getting a pooper scooper. The materials that you choose, the surface that you are planning to use it on, the type of design it is, as well as the price, are all things that you have to look at before you buy. The pooper scoopers that are listed above in the review section are excellent pooper scoopers. They represent some of the best pooper scoopers on the market. But they may not be exactly what you’re looking for. Some people need the best pooper scooper for small dogs, while others are looking for the best pooper scooper for large dogs. Some people are looking for the best scooper for certain types of surfaces. The bottom line is that there is a lot that goes into choosing the right one, and that’s why this buying guide has been created. This guide will give you a great deal of advice as to which pooper scooper to choose if you wish to shop for your own. Hopefully, this will give you the tools that you need in order to narrow down your choices to exactly what you’re looking for and buy the best pooper scooper for your dog, your region or your personal preferences. First, let’s define what a pooper scooper actually is. It is simply a device that is used to clean up dog feces. You do not need a pooper scooper in order to clean up after your dog. You could always grab a grocery bag and try to pick up your dog waste yourself. However, this is really gross and can get quite messy. But a pooper scooper offers a number of advantages including a no-mess pickup and eliminating the need to bend over or get close to the dog poop. Pooper scoopers usually come in two main types: the all-in-one tool or the rake and shovel – sometimes called the dustpan – type. There are numerous benefits to using a pooper scooper instead of cleaning it up yourself with a rubber glove or a grocery bag. For one thing, you don’t have to get anywhere near the dog poop to clean it up. You are several feet away, using the pooper scooper to keep dog waste far away from yourself. This is a health concern in some cases, because if you make a mistake picking up your dog poop and are not able to wash hands thoroughly, you could pass on illnesses to children – especially babies. But a pooper scooper also offers a complete mess free way to clean up after your dog. Most of the pooper scoopers on the market use bags that can be replaced after your dog goes to the bathroom, and then you can pull them out and throw them away without having to worry about any sort of cleaning. The only cleaning that you might have to do is spraying off the rake part of the pooper scooper; which is what actually touches the waste to push it inside of the bucket. However, this is usually done in seconds with the garden hose and can even be wiped clean with an antibacterial wipe. Pooper scoopers also save your back and make it much easier for you to go out on walks with your dog without worrying that you will have to clean up after them. It also provides an easy way for you to keep your backyard clean. Pooper scoopers are generally lengthy enough for you to be able to do cleanup without ever having to bend over. This makes it very easy to pick up after your dog, resulting in a cleaner backyard, fulfillment of responsibility when you take your dog on walks and all without risking back pain from having to bend over to clean up dog waste. The construction materials that your pooper scooper is made out of are usually restricted to one of two materials: plastic and metal. Each of these materials have their own advantages and disadvantages, and choosing which one do you want to get for your dog is usually a matter of availability and personal preference. Let’s look at each of these materials more closely. Metal: Metal is one of the materials that pooper scoopers are made out of. Metal pooper scoopers, which are commonly made out of aluminum, have the advantage of lasting for a very long time and not breaking if the pooper scooper happens to be stepped on or run over with a vehicle. Metal is much more durable than plastic, and that is one reason that some people prefer it over other materials. Plastic: Plastic is much more common though when it comes to pooper scoopers. Most of the pooper scoopers out there are going to be made of plastic. Plastic does have certain advantages over metal. Although it could more easily be broken and need to be replaced, plastic pooper scoopers are much cheaper and they are lightweight and easy to carry around with you when you’re taking your dog for a walk. The weight of your pooper scooper is certainly a factor. When it comes to a tool like a pooper scooper that you have to carry around with you, weight is going to be an important consideration. Because of the nature of a pooper scooper, you don’t want to stick it in the bottom of a dog stroller or strap it on to your belt or something, unless you haven’t yet used it and it has been thoroughly cleaned. That usually means that you want to carry it around with you in your hand, particularly if you have recently picked up dog waste and have not yet found a receptacle in which to dispose of it. That means that your pooper scooper needs to be extremely light and can easily be carried around without any strain. That’s why material is one of the most important considerations. Plastic pooper scoopers are much lighter than their metal counterparts. This is one of the reasons why people go with plastic pooper scoopers more often than metal, although price is also a consideration, and most of the ones that you’ll find only way a couple pounds or less. If you buy a heavy pooper scooper, then you’re not going to want to take it on dog walks with you and it becomes useless for what it was intended for. Compactness is also a factor that you need to consider. A pooper scooper that takes up a great deal of space is not nearly as useful as one that folds up or snaps together to take up very little space in the corner or to be able to be hung on the wall of your garage or on your porch. You want a pooper scooper that is compact, and if it comes in two pieces then you want those two pieces to easily snap together and remain that way so that you do not lose one or the other. How easy your scooper is to use is also a consideration. There are lots of different pooper scoopers out there, but they all work basically the same way. This is a two-part system where one part acts as a rake of sorts and the other part acts as a bucket. The rake scoops the waste into the bucket. This is the basic method by which all of the pooper scoopers out there work. However, sometimes the rake and the bucket can actually be one unit. For example, if the edges of the bucket unit are serrated and then come together to pull waste inside of the bucket, it is also considered a pooper scooper, but it is a jaw-style and works a little differently. The main thing that you want to do is ensure that your pooper scooper is extremely easy to use in a couple of different areas. The first area is picking up the poop itself. You want to simply line up the pooper scooper and activate the unit, pulling the poop inside of the bucket area with no more actions necessary after that. If your pooper scooper doesn’t do a good job of keeping the poop together so that you only have to do one action to pick it up, then you may want to replace it with one of the hundreds of units that do offer that. You also want your pooper scooper to be easy to use in another area: the disposal of the poop. Many of the pooper scoopers currently on the market make this less of a chore by including bags. Of course, the only problem with this is you have to buy bags to continue using the pooper scooper. There are a few out there that are designed for grocery bags, and even the ones that are not designed for that and still sometimes work with them, but the best bags to use are the ones that come with it. There are also pooper scoopers on the market that included a great number of bags when you buy the tool. You obviously need to think about the size of the scoop as well. The size of the scoop is completely dependent upon the size of the waste that you will be picking up. If you get a very small pooper scooper, but you have a large amount of waste to pick up, then you’re going to have to do it in several stages and that is not only messy but it is also a huge pain. The size of your dog’s waste is dependent upon the size of your dog, the breed of your dog and the diet that he or she is on. Make sure that you are aware of this before you start shopping for pooper scoopers, because if you get the wrong size, it is going to be messy and uncomfortable cleaning up after your dog. One of the ways that you can tell what type of dog the pooper scooper was intended for is to check out customer reviews and find out what people are saying about the effectiveness of that particular scoop for their breed of dog. You can also look at the measurements and determine how big the bucket area is and how much it can hold, as well as the size of the rake, to help determine whether or not it is going to work for your dog’s waste. There are several different types of pooper scooper on the market. The type of pooper scooper that you get will depend upon your personal preference. Most people prefer one type over the others, but there is nothing particularly advantageous or disadvantageous with the different types of pooper scoopers. They just work differently. Let’s look at each of them in a little more detail. 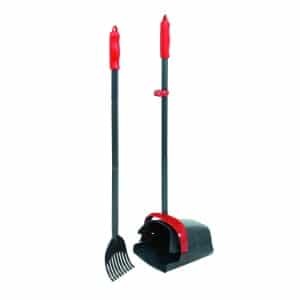 Rake & Shovel: The rake and shovel type of pooper scooper is separated into two different pieces. One pieces the bucket while the other is the rake. You physically manipulate the rake in order to push the dog waste into the bucket. The bucket may have a bag lining that makes it much easier to dispose of your dog waste, or it may simply be bagless. All-in-One: An all-in-one pooper scooper is also a popular option. The all-in-one pooper scooper works very much the same way as a rake and shovel, but instead of being two separate pieces, this pooper scooper is all one piece. You open up the rake by pushing in a handle or pulling on a lever and then grab the poop and release the handle to push the poop inside. Jaw Scooper: The jaw scooper is also an option out there, although not nearly as common as all-in-one and rake and shovel types. With the jaw scooper, when you press the handle the jobs open and you insert the pooper scooper over the waste and allow the jaws to close and push the waste inside. This may or may not use a bag as well. Maintenance and cleaning are important considerations when it comes to your pooper scooper as well. Let’s talk about maintenance first. Most of the time, pooper scoopers are very inexpensive and should not require any maintenance whatsoever. The handle is usually operated by some kind of a spring, and it will last for the lifetime of your pooper scooper. In some cases, especially in metal pooper scoopers, they are more expensive and made to last for a very long time. You may wish to do maintenance on these types, but most of the time there will be no maintenance involved. As far as cleaning goes, you definitely want your pooper scooper to be easily cleaned. This is one of the problems with the metal pooper scoopers. Waste tends to stick to them much more that it tends to stick to plastic pooper scoopers. You’re going to have a much harder time cleaning your pooper scooper if it is made out of metal. However, plastic pooper scoopers – especially nonstick plastic materials – are much easier to clean and can simply be sprayed off quickly to make the pooper scooper as good as new and ready for your next walk with your dog. This is one of the reasons why people go with plastic; although it is not the only reason. Something else to keep in mind when it comes to maintenance and cleaning is that you don’t want waste to be able to get into springs or areas where it is difficult to clean. If you are not able to clean your pooper scooper thoroughly, it is going to smell and make it problematic for you to take it with you because it will have dog poop on it that is still being broken down. Make sure that the one that you choose does not have any springs or difficult areas to clean near the area where the poop goes into the bucket. This will make it a much more effective tool, and prevents you from spending 15 to 20 minutes trying to make sure that your pooper scooper is completely washed off. The most important thing to ask yourself before you buy a pooper scooper is what kind of surface you plan on using it on most of the time. The surface that you use your pooper scooper on will have a major impact on the one that you buy. That’s because each one of the surfaces is a little bit different, and requires a slightly different pooper scooper design in order to function correctly. Let’s take a look at each surface in more detail. Grass: Grass is probably the most common surface that you will be cleaning dog poop off of. That’s because dogs tend to prefer grass when it comes to going to the bathroom, and most of the area that you will be covering on your walks will be surrounded by grass. That’s why most of the pooper scoopers on the market are actually designed to work in grass most effectively. That means that they have serrated edges that will scoop up the waste without tearing at the grass or destroying it. Gravel: Another surface is gravel. Gravel may not be as common as grass when it comes to your dog going to the bathroom, but it is a consideration if you have a gravel driveway or regularly traverse areas on dog walks that are made of gravel. Gravel is a little bit different than any other type of surface, because it is made up mostly of rocks and you need a pooper scooper that is going to be able to grab the poop and avoid pulling up a bunch of rocks at the same time. Asphalt: You may also need to use your pooper scooper on asphalt. Asphalt is the material that most of the roads out there are made from. If your dog poops on the road, you are going to want to be able to clean it up. When it comes to asphalt, most of the surface area smooth, although there may be a few loose rocks and chunks that you have to deal with. That means that you want a pooper scooper that has a rake that does not pick up much of the loose debris. Cement: Cement is a pretty common material when it comes to pooper scoopers, because sidewalks are made out of cement. Although your dog prefers to go on grass, there may be instances where that is not possible because of you holding the leash or other restrictions, and so you may have to clean up your dog’s poop off of the cement. In the case of cement, you want to make sure that you have a rake that has tines that are close together so that it is able to grab the waste in one large section. Dirt: You may also need to occasionally pick up your dog’s waste from dirt surfaces. Dirt works pretty much in the same way as cement and asphalt. You want to make sure that your rate tines are close together and are able to scoop the waste into the bucket without leaving any behind. It is pretty rare to encounter dirt paths unless you are purposely taking your dog on walks on them or live in a rural area. The bottom line is that there are a lot of things to consider when it comes to buying a pooper scooper. This may seem like a simple device for most people, but there is a lot that goes into choosing the right one. You have to take all kinds of things into consideration like what kind of surface area that you will mostly be using the pooper scooper on, whether you value lightweight and compact over durability and what style of pooper scooper you prefer over others. This buying guide has been created to offer recommendations on some of the best-rated pooper scoopers, as well as information on individual factors that determine what kind of pooper scooper you want to get. The main thing to keep in mind is that it all comes down to your dog, where you take your walks and your personal preferences.